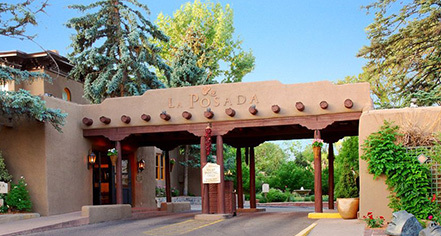 Located in the capital city of New Mexico, La Posada de Santa Fe is in a prime location for art and entertainment. 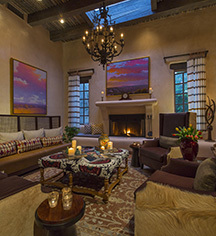 From Native American traditions of weaving, pottery, and jewelry to later Spanish colonial art forms, Santa Fe has had a long history of being an artistic center with a culturally rich background. Today with folk art museums and markets, the city continues to celebrate this. It has been designated as a UNESCO Creative City in Design, Crafts and Folk Art. Santa Fe Plaza: In 1610, the plaza was founded as the social and economic center of Santa Fe. It was found at the end of the El Camino Real, the Santa Fe Trail, and the Old Pecos Trail. Today, the Plaza is a National Historic Landmark and it continues to serve as a central gathering place, surrounded by shops, restaurants, museums, art galleries, and venues for a variety of performances. Canyon Road: Famous for its art galleries, this half-mile of road in the Historic District of Santa Fe has much to offer. This scenic trail will lead visitors to museums, art galleries and studios, restaurants, and more. Georgia O’Keeffe Museum: Dedicated to one of the most significant artists of the 20th century, The Georgia O’Keeffe Museum is dedicated to not only O’Keeffe’s paintings, but her life and artistic process as well. The museum houses over 3,000 of her original works. Cathedral Basilica of St. Francis: The Cathedral Basilica of Saint Francis of Assisi was built between 1869 and 1886 under the direction of Archbishop Lamy. It is built in the French Romanesque Revival style and is one of Santa Fe’s most celebrated landmarks. New Mexico Museum of Art: Originating in 1917, the New Mexico Museum of Art is the oldest art museum in the state. The museum offers a collection of over 20,000 works of art in a variety of styles and mediums. Museum of International Folk Art: This cultural institution boasts a collection 135,000 artifacts from around the world. Loretto Chapel: A historic museum and wedding venue, the Loretto Chapel is perhaps most famous for its helix spiral staircase leading up to the choir loft. It has two complete 360 degree turns with no central pole for support. To this day, there are many unanswered questions about the structure and the design, which were both considered highly innovative for the time. The builder's identity remains a mystery. Palace of the Governors: This National Historic Landmark was originally built in 1610 as seat of the Spanish colonial government. It was used as a government related structure from then until 1909, when it was established as the Museum of New Mexico. It is one of the oldest buildings in the United States and has the distinction of being the oldest continuously occupied public building the United States as well.